One Tuesday night, I accidentally took a two hour nap. I woke up at 9:30PM with an urge to go grocery shopping. 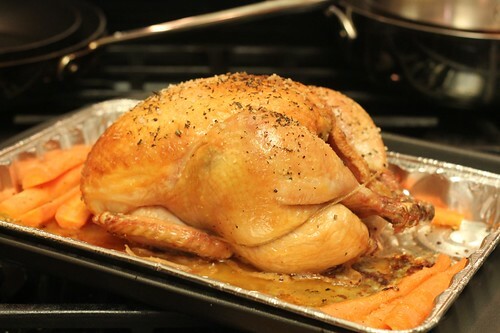 Not very good at resisting my food-related urges, I walked into Ralph's at 10:00PM and bought myself a nice organic, free-range chicken. This is why I roasted a chicken on a random Thursday night. This is the second time I've roasted a chicken using this procedure. The last time I did it was for Thanksgiving. Both times were a success, so I can confidently say, this is a foolproof method. 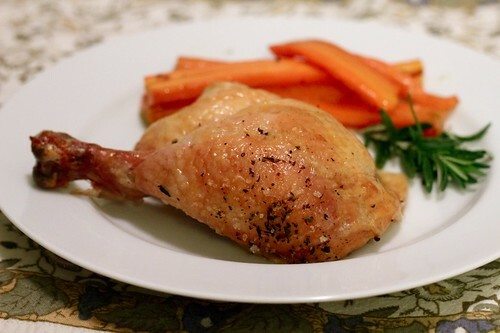 Basically, watch this Thomas Keller video, follow it, and you'll have a delicious, perfectly-cooked chicken that is juicy and flavorful with a golden, crispy skin. 1. Pick out a 2-3 pound bird. The smaller ones taste better. 3. Rinse the chicken. Exfoliate the skin with salt if you have too much time on your hands. It's not really necessary but you do end up with taunt, beautiful looking chicken skin. Pat the chicken try with paper towels. 4. Salt the chicken inside and out. Leave it uncovered in the fridge overnight. Thomas Keller doesn't do this step, but I feel like it makes the meat more flavorful. 5. 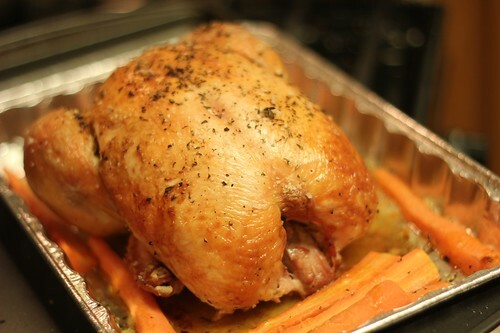 Before roasting, make sure the bird is REALLY dry. This helps the skin crisp up and ensures the bird is roasting rather than steaming. 6. Stuff the chicken with cloves of garlic, thyme, and rosemary. Sprinkle coarse sea salt and freshly ground pepper on the skin. You should be able to see the the coarse salt on the skin even after it's roasted. 7. Truss the chicken! Sounds complicated but it really isn't, and it's an important step in getting the chicken to cook evenly. If you're unsure of how to truss a chicken, there are plenty of YouTube videos to watch. That's how I learned. 8. Roast at 450 degrees Fahrenheit for 50-60 minutes. Don't disturb the chicken! No flipping, no basting, maybe just rotate the pan once halfway through. 9. Carve the chicken and eat breast, thighs, etc. and eat civilly with knife and fork. Then, as a late night snack, attack the carcass with you bare hands and get all the good meat between the bones. Don't miss the chicken "oysters"--they're the best part. and YES, the oysters are the best part!!! I just roasted a chicken on Thursday night too!! So strange, it must have been something in the air. Yours looks so yummy! 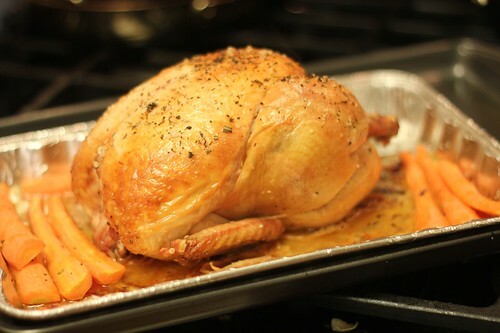 I tried the recipe 'Juicy Roasted Bird' from allrecipes.com that was divine. I stuffed lemon slices and Bay leaves under the skin for more flavor and a beautiful presentation. I made roasted carrots and potatoes as well and the hubby loved it. Thomas Keller - my hero! Don't forget step 10 - save carcass for chicken stock.